Diameter: 5cm or 1.97” app. Full length: 12cm or 5.12” approx. This simulation jellyfish is not luminous, dark environment itself wont make this glowing, but jellyfish are high permeability, with the fish tank light irradiation will have fluorescent effect. 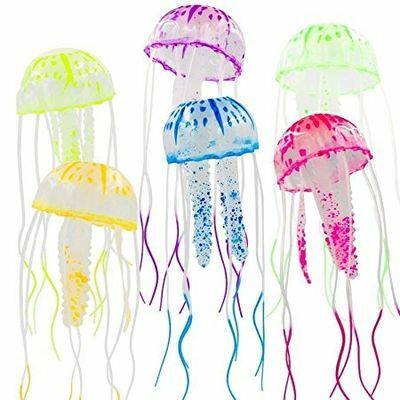 Please according to the light, choose jellyfish color, you can choose with their fish tank light contrast jellyfish, so jellyfish fluorescent effect will be more obvious, better look. We will try to send the specific colour as ordered if it is not available we will try to send the best available colour. Features: Ideal decoration for the fish tank or aquarium Incredibly detailed imitative jellyfish Transparent colors; air filled floating Moved by water currents Attaches by thin invisible line and suction cup, can be controlled the random position Harmless to all fish Realistically molded in soft silicon For both fresh and softwater Glowing effect: The glowing effect is the fluorescence effect: When the object obsorbed the energe like ultraviolet, Solar short wave, it will slightly emit the light for a while in darkness Specification: Material: Soft silicon Color: Blue, Orange, Pink, Purple, Yellow, Green 6 colors Diameter: 5cm or 1.97” app. Full length: 12cm or 5.12” approx. Function: Aquarium Decoration Pack: 1 Pc only of any 1 colour Special Note: This simulation jellyfish is not luminous, dark environment itself wont make this glowing, but jellyfish are high permeability, with the fish tank light irradiation will have fluorescent effect. Please according to the light, choose jellyfish color, you can choose with their fish tank light contrast jellyfish, so jellyfish fluorescent effect will be more obvious, better look. We will try to send the specific colour as ordered if it is not available we will try to send the best available colour.